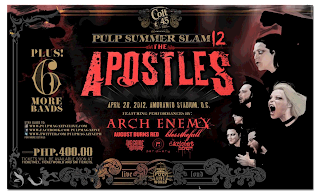 Pulp Live World Productions, Inc. will again bring you the annual music festival Pulp Summer Slam 12: The Apostles, the riot of local and international bands, this April 28, 2012 at the usual pit Amoranto Stadium in Quezon City. The 12th slam will be headlined by Archenemy, August Burns Red, Bless the Fall, Darkest Hour, Periphery and We Came As Romans. Aside from these six international line-up, another six of our very own local bands will be performing in this hardrocking event. Among these are Kamikazee, Urbandub, Franco, ChicoSci, SIN, and my personal favorite, Intolerant. This year's event, Pulp Productions will also be giving out six freebies (beer, pizza, soda, cellphone load, discount to the official gig shirt, and, condoms), so everybody's marking April 28th as the 666 day! Last year, Pulp Summer Slam 11 was spearheaded by three of the world's heavy metal bands, Anthrax, Hellyeah, and Death Angel where 30,000 fans marched to the Amoranto Stadium and headbanged for the rest of the 15-hour gig. So if you hate going to your "usual gig" where your favorite bands play a short 3-song-set for your hard earned money, this is the show for you. You won't have to choose between quality and quantity, cause Pulp Summer Slam 12 will be giving you both. Tickets are now available at Ticketnet, TicketWorld and SM Tickets for Php 400 (approx $9 each). Posted in Bands, Concert, Music, pulp 2012, pulp summer slam 12 . Bookmark the permalink. RSS feed for this post. Nice Pulp Summer salm post. Thanks for sharing this information which is useful for all. Wow my hubby would love that.Beer, Pizza etc and heavy metal music. No problem mam. Thanks for dropping by din. Papuntahin mo si hubby mo, ahehe. 400 lang yan! wow! a music festival with lots of good performing bands locally and international .i would love to watch it. I'm sure that the fans of this band would enjoy this show. I've been to one Pulp Summer Slam before but it wasn't my cup of tea. tickets are priced reasonably and I bet it would be another anticipated event esp. for heavy metal fans. waaaaaaaah! another gig to look forward to..thanks for sharing! I have been attending pulp yearly. Hehehe. Nice post. Gusto ko din ng PR so I post this in my blog..